When it comes to downtown Vancouver, well-prepared, traditional yet inexpensive Chinese food, typified by Chinese noodle houses, is hard to come by. What you find is a food court version of Chinese, peddling radioactive red sweet and sour pork & spring rolls filled with cabbage. I simply think the sky high rents of the downtown core prevent a “Congee Noodle House” or “Michigan Noodle Restaurant” caliber Chinese Noodle house from setting up. As a result the prospect of finding an excellent rendition of Wonton Mein within walking distance from my work place is not good. Although I have hopped on the Canada Line to go to Michigan Noodle restaurant in Richmond, because I was having a really bad day at work. Unfortunately it’s too time consuming to travel to Richmond all the time. I didn’t have very high expectations when I walked into East Fusion Food in the Tintseltown shopping centre. 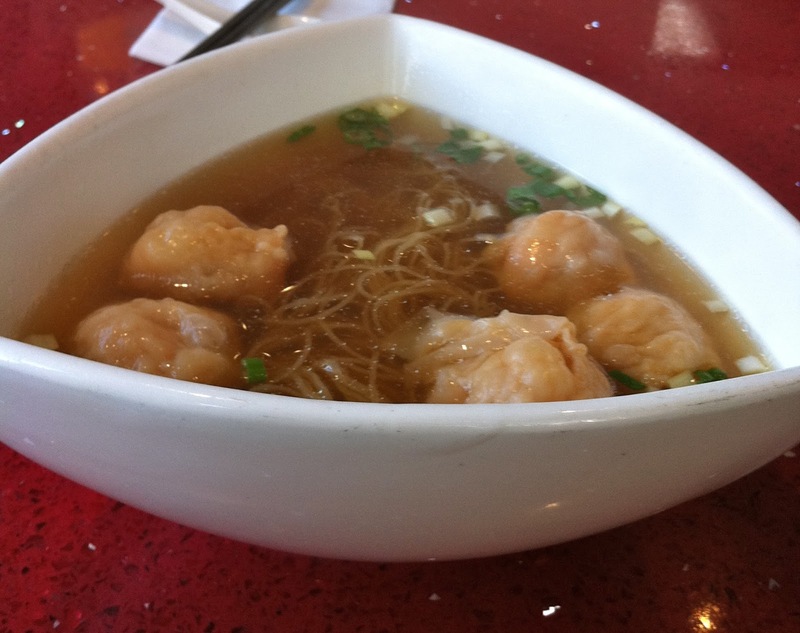 Most of the wontons mein I have tried between Cambie Street & Denman Street are mostly pork, contain a course filling, and served with soggy noodles in a bland MSG laden soup. As per usual I added veggies (Gai Lan (Chinese Broccoli) – which came on seperate plate) to my wonton noodle soup. I was relieved when my order arrived on my table. 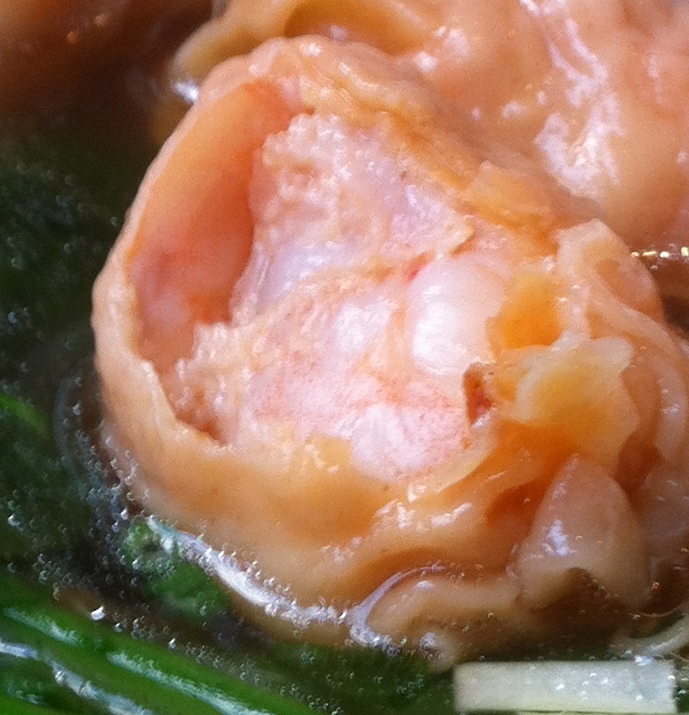 East Fusion serves a traditional wonton, using a superior clear broth. I was happy to see a pink hue radiate out from underneath the wonton wrapper. The filling was 100% shrimp and had a nice bouncy texture. The noodles were executed well and still had some resistance. The soup had a very strong seafood taste and was complex. After consuming my meal, I was mildly thirsty. If there was MSG in the soup, the cook used it sparingly, which is good for me. Now here’s the problem, on subsequent visits, the soup was wildly inconsistent. It ranged from bland, like some one had water it down, to extremely salty. Most of the components of the wonton mein were good and as such East Fusion is an alternative to sky training it to Richmond every time I have a wonton craving for lunch. However, due to the inconsistent nature of their soup, it doesn’t crack my top 3 wontons, which remain: 1.Michigan, 2.Tsim Chai & 3. McNoodle. Next Post Food for Thought: Are we pre-destined to eat what we eat?